The city of Soledad de Graciano Sanchez, Mexico is taking steps to ensure the health and wellbeing of it’s animals in 2019. And not just the pets kept in homes, but the strays that wander its streets, too! 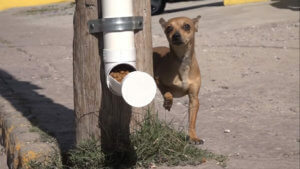 According to local officials, there are an estimated 300,000 stray dogs roaming the city that are in need of basic care. Instead of looking the other way, the city government is working hand-in-hand with it’s dog-loving citizens to provide for these homeless dogs. One of the first initiatives taken by the city this year is a program called “ComeDog.” Together with the local citizens’ response group Respuesta Ciudadana, City Hall placed 15 food dispensers in public areas where dogs with empty bellies can find a free meal and clean water. The dispensers are made of simple PVC pipe and filled with dry food donated mostly by the people of the city. Respuesta Ciudadana will be in charge of making sure the dispensers are filled regularly and offering a friendly hand to the dogs they meet there. These two programs are only the beginning of a trend that officials in Soledad de Graciano Sanchez hope will eventually lead to a brighter future for Mexico’s dogs. Ideally all these dogs will be provided with shelter, food, and love in the near future – each in a home of their own! Other cities in Mexico are already considering following Soledad’s example by introducing similar programs to work for the benefit of their homeless animals.